Remove the replacement fan module from its packaging and place it on an antistatic mat. 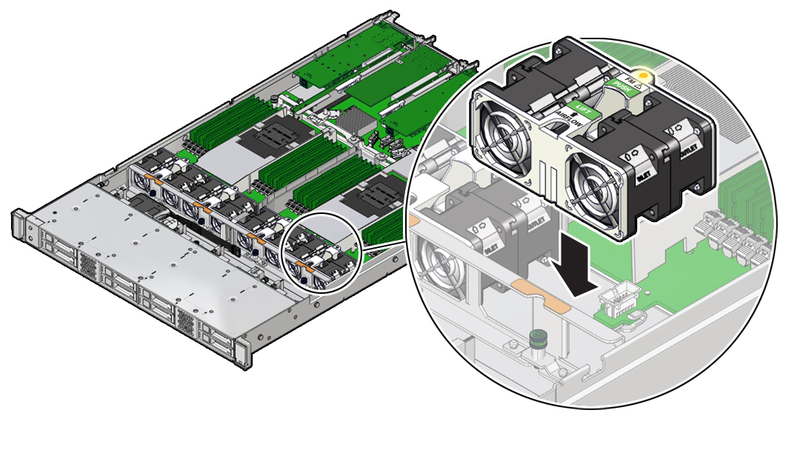 With the server top cover removed, position the replacement fan module into the server. Verify that the fan module status indicator (LED) that aligns with the replaced fan module is extinguished. Verify that the Top Fan Fault LED on the front of the server and the Fault-Service Required LEDs on the front and back of the server are extinguished. See Troubleshooting Using the Server Front and Back Panel Status Indicators for more information about identifying and interpreting system indicators. Otherwise, return the server to operation. See Returning the Server to Operation.